There have been several anecdotal reports of leprosy in humans who have handled, killed or eaten armadillos. (Health.com) -- Several years ago, an 81-year-old woman with a raised patch of dry skin on her arm visited Mississippi dermatologist John Abide, M.D. Although the lesion looked only slightly abnormal, a series of lab tests revealed that it was a symptom of leprosy. "I thought, 'Leprosy, are you kidding me?'" says Abide, whose practice is in Greenville. His surprise was understandable. Each year only about 150 people in the U.S. are infected with leprosy, a bacterial disease that can lead to nerve damage and disfigurement. In most cases, people are infected after being exposed to saliva from an infected person, usually while traveling to parts of the world, such as Africa and Asia, where the disease is more prevalent. But Abide's patient didn't fit this description. A new study in the New England Journal of Medicine may provide an explanation for her case: armadillos. The leathery shelled mammals, which can be found in 10 states throughout the Southeastern U.S., are the only animals besides humans known to carry leprosy. There have been several anecdotal reports of leprosy in humans who have handled, killed or eaten armadillos, or who may have been indirectly exposed by gardening in soil where the animals burrow, as was the case for Abide's patient. But until now, experts haven't been able to confirm that armadillos could pass the disease to humans. The study provides the strongest evidence to date. Researchers analyzed the genomes of leprosy-causing bacteria collected from seven patients and one armadillo. After identifying specific strains of the bacteria, they compared them with a larger group of infected people and armadillos from around the world. Of the 50 patients and 33 wild armadillos the researchers analyzed from the U.S., 25 patients and 28 armadillos shared a genetically identical strain of leprosy bacteria. And at least 8 of the 25 patients carrying the strain reported contact with armadillos. However, he adds, the chance that the humans with the armadillo-specific strain were infected by some other means is about 1 in 10,000. 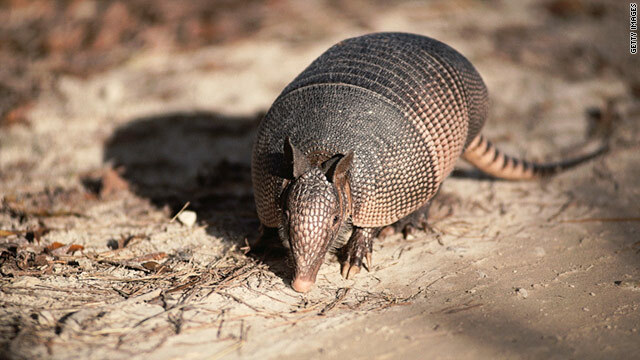 The armadillo population in the U.S. has been estimated at 30 to 50 million, and studies suggest that, in some places, up to 15 percent have leprosy. For now the infected animals are concentrated in Texas, Louisiana, Mississippi, Arkansas, and Alabama, but the armadillo population appears to be spreading north and east and could bring leprosy with it. Truman says that people in those areas may eventually see a minor increase in risk, but so far leprosy has not been detected in animals on the East Coast. "Leprosy is a rare disease and will remain a rare disease," he says. Still, doctors should be on the lookout for signs of the disease, says James Krahenbuhl, Ph.D., director of the National Hansen's Disease Program. "Most physicians are unaware that leprosy even exists in the U.S., and they miss the diagnosis." Leprosy usually becomes a chronic disease, Krahenbuhl explains, but it can be cured if it is treated with multiple drugs in the early stages, when the disease has only caused skin lesions. Left untreated, it can progress to nerve damage in some patients. Abide suspects that new cases of leprosy in the U.S. are underreported, because the early signs can be easy for patients and doctors to overlook until decades later, when more serious symptoms appear. "It kind of makes me wonder, as subtle as it is, if I'm missing something," he says. Up to 30 percent of residents in the rural area he serves have been in contact with armadillos, Abide estimates. He urges his patients not to touch, handle, or eat the animals, and to steer clear of souvenirs made from armadillo carcasses, which are popular in Texas. The new study should help raise awareness, he says. When he tells his patients that armadillos cause leprosy, he explains, "They kind of look at me like I'm crazy."